These are a perfect option if you have a busy vacation schedule, but want to see a little more of Baja than what immediately meets your Baja eye! From a one day tour out of Cabo, in order for you to see what has been hiding from you just around the corner, to a 15 day full Baja Peninsula discovery - and all our tours are custom built for you. Perhaps you are more interested in enjoying Baja itself and the adventures and locations it offers, rather than have to deal with tackling the Baja desert behind the wheel yourself. An arrive and drive program that gives you a choice of vehicles, including racing the Class 5 Open car that has won the last two Baja 1000 races in its class. A nice, easy and fun way to taste a little of Baja whilst being adventurous in this very capable 4x4 REEPER vehicle varying from 4 hours to a full day’s experience. Tour Baja in style on one of our motorcycles or quads. We have a large variety of bikes to choose from and the tour will be totally customized for you. With just one race to go on the 23 & 24th November at the Circuito Bronco Race Park in La Paz, Team No Limits is currently leading all the classes that they have raced in this season. Andrea Tomba is almost certain to take the 5th Championship victory in a row, 2009, 2010, 2011, 2012 & now 2013, as he currently has been able to secure a 50 point gap between himself and Enemesio “ El Pechi” Lopez , who has proven to be a real contender for 2014 in his super-fast and light truck. As far as we know, this is the first time that a driver in Southern Baja secures five consecutive Championships, and this certainly could not have been achieved without the support of Andrea’s great sponsors, such as Quaker State, K&N Filters, OPTIMA Batteries, Vision X Lights, Raceline Wheels, Pro Race and the whole No Limits / ATRacing team. Sandy Hall has also secured the Class 18 Championship, as long as he can start at the Circuito Bronco, as he has managed to get a 45 points lead in what has proven to be an extremely dependable Razor, and an immense fun machine. If you haven’t raced before, and want to give it a try in something a little smaller with all the fun of its big brothers, give us a call and let us set a race for you in our machine! 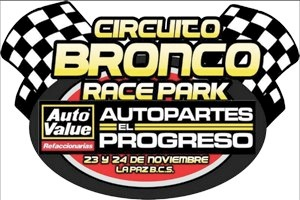 The nail biter at Circuito Bronco will be Class 2, where Sandy is currently leading with a mere 1 ( yes… ONE) point difference with Pepe Vizcaino driving the ex-McMillin Class 1 car. There is currently a little controversy over the points awarded to Pepe in the Dos Mares race, which the organizers are currently reviewing, and should the points awarded prove to be a mistake, it will give Sandy an additional 12 point lead, which will be quite a bit more breathing room. The Circuito Bronco will prove to be a lot of fun… Don’t miss it!